In Dancing with Dynamite, Benjamin Dangl explores the relationship between social movements and left-leaning governments in South America. In seven interesting if uneven case studies, he takes the reader across South America, attempting to map the left turn of the continent at the level of the grassroots. 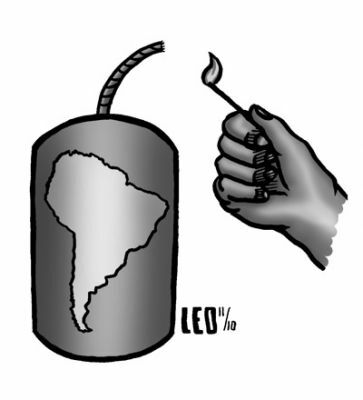 While Dangl’s coverage of South American social movements brings the reader far beyond what one can glean from mainstream U.S. media coverage, Dancing with Dynamite could use less rhetoric and assertion and more research and analysis. Dangl’s methodology consists of interviews with social movement participants — apparently chosen by who would speak with him — and citations from newspapers and web coverage. Although this makes for lively reading, he could benefit from engaging with academic or theoretical literature, a broader pool of interviewees and more time spent in each country. Dangl’s focus on interviewing participants in social movements perhaps contributes to his tendency to fetishize movements while viewing association with the state as inherently corrupting. For Dangl, the relationship between social movements and left-leaning governments takes on two basic forms: either social movements get states to grant their demands, such as land redistribution or social welfare programs, or the state co-opts, demobilizes or otherwise saps the strength of social movements. Or, sometimes, both. Dangl seems loathe to admit that there can be a dialectic, productive relationship between social movements and states, wherein movements not only push governments to the left, but states also create space for and strengthen social movement activity. This is a particularly striking omission given that this is the process that his chapter on Venezuela depicts. The Communal Councils that Dangl discusses as means of community self-organization and empowerment were created by Chavez’s fiat. In his conclusion, Dangl attempts to draw lessons from South American struggles for the North American left, focusing on the transmission of tactics such as factory occupations or occupations of foreclosed homes. The real lessons to be drawn from the left turn in South America, however, are more strategic than tactical. The most radical processes of social transformation that Dangl discusses, those taking place in Venezuela and Bolivia, are precisely the ones where strong social movements are closely connected to the state. By contrast, the piqueteros of Argentina and landless workers of Brazil, without strong ties to any electoral party, have been unable to convert their mobilizations into similar social gains. While Dangl is right that the left cannot simply vote and then go home, he is wrong to counsel so strongly against the perils of social movements dancing with the state. The choice between taking state power and turning one’s back on the state is a false dilemma. It is high time for the left to move beyond stale debates that hark back to the First International and instead try to understand how actual processes of social transformation take place. While this is a question for practice, at the moment South America is a laboratory of practice. And for all its limitations, Dancing with Dynamite is a fascinating account of the experiments happening there.